Liberty Harper literally “grew up” with franchising, opening – along with her parents – the first Curves for Women franchise in California when Harper was just 18 years old. Three years after that, she founded Liberty Fitness, which a year later, became a franchise and grew to 60 locations, before the family sold the company to a private equity group. Now, just over a decade later, Harper is back in the game as director of operations for Texas-based Envie Fitness for Women. She’s planning to open her own studio franchise in San Diego by year’s end. And she’s not even yet 30. My first taste of franchise ownership was in 1998, at 18 years old. My parents and I opened the first Curves for Women in California and a second location a year later. We sold both in 2000, and then in 2001, when I was 21, I founded Liberty Fitness. Liberty Fitness became a franchise in 2002 and grew to over 60 locations by 2004, when we sold the company to a private equity group. 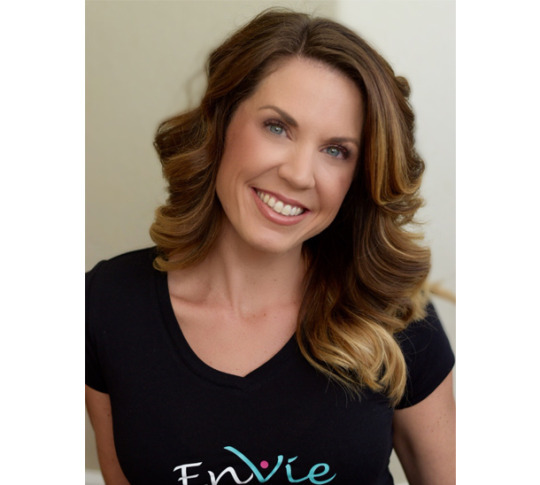 I am elated to get back into the franchisee seat as the first EnVie Fitness for Women franchisee in California. It’s all I know! I have literally grown up in the industry and have been fortunate enough to serve as a franchisee, franchisor, as well as supplier to the franchise industry. It’s the best, and officially my “thing”! Before I even signed on to be a franchisee, I was already with EnVie as its director of operations, so naturally I believe in the concept and everything that it stands for. EnVie was literally a perfect fit, as I’ve always had a passion for health and fitness. I wanted to be a part of something that really makes a difference in women’s lives and is dedicated to helping them become healthier versions of themselves. EnVie is not only a place where women can work toward their health and fitness goals; it’s also a community, a support system, where women can bond with one another, whether that be inside or outside the studio. At EnVie, client satisfaction is the utmost priority, so we continuously strive to cater to our clients’ demands. As EnVie’s director of operations, I was able to work with my incredible team to create the newest model of our studio and a great business model that will further catapult EnVie to the forefront of women’s fitness. We are in the middle of the opening process, but we estimate spending under $100,000, for sure. I have had a lot of personal experience to draw from, but I learn constantly from my EnVie team, business partners, family and friends. So far it has been in obtaining a location. The real estate process can be pretty darn slow! Our first location fell through, but we believe that everything happens for a reason and we have already come across a much better space. You must find the right combination of doing something you truly love and a great business model. Do not purchase yourself a job. Think big and be sure you are always working on your business not just in it. Grow, grow, grow! EnVie will be growing by leaps and bounds over the next few years, and we cannot wait to make a huge splash in the fitness industry in the United States, as well as abroad!